Today, the breakfast I made was healthy, timed well, balanced and delivered without meltdowns and tantrums. Today, my workout actually happened. The stars aligned and I was able to be true to my personal goals. Today, my child ate his beets (because although both kids have loved beets since they were babies, they have joined forces and sworn off beets for a month without any warning or explanation). Today, I was on time to my child’s pediatrician appointment (I personally value timeliness, my kids do not, today I won and we made it on time). Today, I kept to the schedule I set for myself. Some days, someone gags on their toothbrush and throws up before school at the same moment someone else throws himself off the couch onto his face mid tantrum and my schedule is no longer my own (these are real events based on real people, the individuals will remain unnamed). Today, nobody cried before 8 am (me included). Today, I showered and put makeup on. (Tomorrow I’m committed to doing my hair, baby steps). Today, I didn’t have to call poison control because my child didn’t ingest a random medication someone unknowingly dropped on the floor. Today, (so far) all poop stayed in diapers rather than ending up in someone’s pants or on a previously clean (see shower reference above) part of MY body. Today, my children both went to bed easily, drifting into their dreamy sleep after I left the room and both slept through the night. Unlike previous nights recently when I had to rock my 2 year-old to sleep because he was convinced the teddy bear on his wall (which has been there since his birth) was actually a pig trying to eat him. Today, the absolute nightmare that is 2 year molars coming in has given us a morning off and our relatively happy and reasonable 2-year-old* has returned, however briefly. (*I realize “happy and reasonable 2-year old” is the definition of an oxymoron). (**Who am I kidding, have I ever had the upper hand? I often feel like the last scene in the movie Seven when Morgan Freeman yells “John Doe has the upper hand” as he warns everyone to stay away. Some days, that’s my life with kids in a nutshell. Shock and dismay in a box and me screaming for everyone to stay away no matter what they hear because the child has the upper hand). Today, I am fully aware of the fact that parenting is little more than a game of weighing the odds, deciding how to gamble, becoming masters of anticipating the unknown and never (EVER) being snarky and assuming that today will look anything like tomorrow. In this social media rich time we live in, it’s easy to see someone with their humble brag post about how their little angel just can’t get enough kale or to see another post a picture of their perfectly behaved toddler fully engaged in today’s art project. And when we see that, it’s easy to think we’re doing it all wrong because our life looks just a fraction of an inch from full on mayhem. But imagine if we all were mindful that today might be one of the good ones. Today might be the day that the lights all turn green on your drive and your kids eat well and everyone slept and you got your workout in and have a fresh coffee in hand and are on top of the world. But tomorrow…oh boy. Tomorrow may be a poop on your shirt, no hope of exercise, kid needing an X-ray (again) kind of day. This is parenting. This is doing our best and never, ever getting to the point where we see a parent struggling with a milestone and assuming we have it all figured it out. Because here’s the thing, just when you allow yourself to think that you should teach and franchise your own parenting class because your 2 year-old sailed right through the terrible twos…your child turns three. And a 3 year-old can knock even the most secure parent off of their pedestal. So just for fun, let us all start our dialogue (internal or with others) with the word “today” and a mindfulness that today may look like we are winning at this or losing badly. But tomorrow is another day. And tomorrow your kale eating little doll may decide they are only eating waffles from now until forever. Today they may all sleep, at the same time, through the night. Tomorrow, your previously perfect sleeper might start a sleep regression you never saw coming. One that has you searching the parenting books on how the Ferber method could fail you when it seemed so airtight since he or she was initially trained. For today, let us all give each other permission to breathe a sigh of relief that it’s impossible to control much of what the tiny humans do. We can do our best, educate ourselves, avoid the obvious SIDS risks and cut up the grapes into minuscule pieces. But even when we do, our child could decide to try a backflip off the end of our bed and end up in a cast at 18 months old (hypothetically of course). 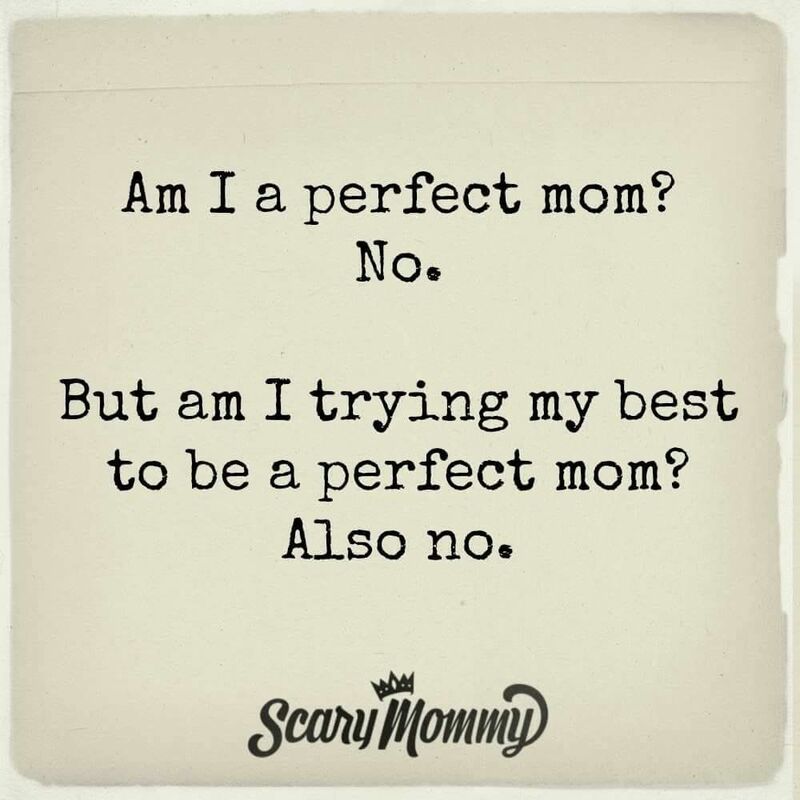 *A thank you to ScaryMommy for always nailing it with the memes.